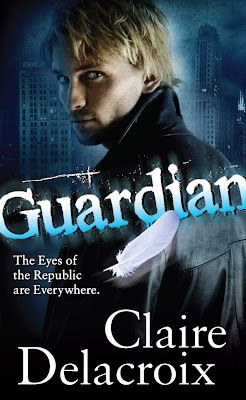 Here is the cover art and a preview of Guardian by Claire Delacroix, the sequel to last years excellent Fallen (my review of Fallen here) coming this October. The series is a blend of Science Fiction Romance and urban fantasy. Claire Delacroix also writes the Dragon Fire urban fantasy series as Deborah Cooke. You can read an excerpt of Guardian here. The enslaved shade known only as 23 believes that her destiny lies beyond captivity. After all, the angels have given her the gift of foresight – and the command to use it for good. Abducted when her own escape goes awry, she fears her captor’s intent – even when he confides her real name, Delilah. Rafe, a fallen angel, may be on a divine mission to ensure that Delilah becomes Oracle of the Republic—but he’d much rather enjoy earthly pleasures. Delilah’s genuine gift, though, reawakens his idealism – and memories he’d feared lost forever. Drawn to Rafe but fearing the loss of her gift if she surrenders to his charms, Delilah knows she has to leave him. But fleeing his guardianship sets assassins on her trail, leaving her without Rafe’s worldly resources. As Rafe races to save Delilah, he knows he isn’t just saving her for the good of the Republic, for the angels, or for the future--he’s saving her for himself, and he doesn’t care what price he pays to do so. Thanks for the preview! I'll bookmark this for my next link roundup. Heather this looks like a great follow-up to Fallen which I think we agree can be considered SFR in many ways. The cover model looks like the same guy from Sherrilyn Kenyon's Dream Warrior. Is it?